While nearly all antique engagement rings are unique in some way, few are like the rare ones from the Art Nouveau period. Learn more about the craftsmanship that defined this movement. Toward the end of Queen Victoria's reign, and just before the beginning of the 20th century, a new style movement was making its way into popular culture. Starting in 1890, and lasting until 1919, Art Nouveau (literally "new art") began to be seen in everything from architecture, to poster design, to jewelry. Unfortunately, although much of the architecture still stands, and the posters and other artistic elements from this period remain, Art Nouveau engagement rings are quite rare. The Art Nouveau movement coincided with the Arts and Crafts movement, both of which stressed craftsmanship and design. 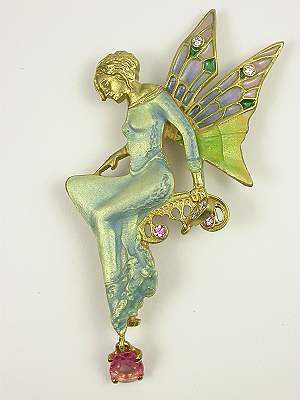 While much of Victorian fashion and style had been influenced by the Queen, Art Nouveau design elements, including those in jewelry, were influenced by the artists themselves. Names like Horta, Mucha and Lalique define the Art Nouveau period. Art Nouveau placed an emphasis on the natural world, so much of the jewelry in this period was made of less precious metals including silver, low-grade gold, and even steel. Certain animals were popular motifs, such as the serpent, carried over from its Victorian popularity, as well as dragonflies, butterflies, and peacocks. 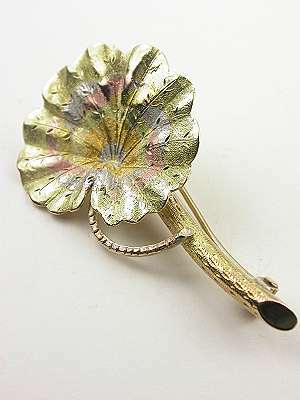 All kinds of flowers and leaves were also incorporated into Art Nouveau jewelry design. Some jewelers used only portions of these animal and flower themes, such as insect wings, flower buds, and vine tendrils. Rather than diamonds and other precious gems, Art Nouveau jewelry featured enamel and semi-precious stones such as opal, turquoise, lapis lazuli, amethyst, and even the ubiquitous quartz. This could be why so few Art Nouveau engagement rings remain, as since that period, the demand for precious-gem engagement rings has increased, and they're most often seen as the "traditional" choice. However, this is also changing as more and more brides seek engagement rings that offer more variety and flair than their simple diamond solitaire counterparts. Because the Art Nouveau movement emphasized design, jewelers came to be seen as artists rather than craftsmen. Much like Victorian jewelry, Art Nouveau jewelry often included filigree, as well as twisted wire, and other intricate metal designs, further demonstrating jewelers' skill and artistry. With their natural influences, unique elements, and particularly their rarity, Art Nouveau engagement rings can be beautiful expressions of individuality, and artistic appreciation.